Fried rice is a great dinner or lunch to throw together when you are limited on time. Not only is it fast to make but it is also full of vegetables, protein and plenty of delicious Chinese food flavor! You can find many different types of fried rice (chicken, shrimp, pork etc), but this recipe sticks to the basic delicious flavors and highlights eggs as the main protein. While fried rice purists tend to argue that fried rice should be left un seasoned (there is a lot of flavors already thanks to the vegetable medley! ), this recipe uses a touch of soy sauce as to add a little bit more taste. Oyster sauce is also commonly used in fried rice recipe and can give the rice a nice fishy flavor. 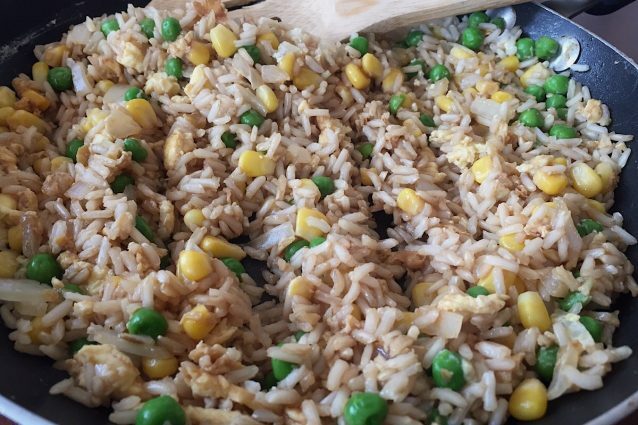 This recipes uses frozen vegetables to make the fried rice even faster to prepare. You will never need to order take out fried rice again now that you have this great recipe! Cook the rice according to the package directions. Once cooked, set aside for now. Dice the onion into small pieces and set aside as well. In a small bowl, scramble the eggs with a fork so that they are well broken up. Heat the sesame oil in a large skillet or wok. Add the scrambled egg, diced onion, frozen corn and frozen peas. Mix all together being sure to break up the egg as you mix. Add the cooked rice and soy sauce to the pan and heat for about a minute, mixing constantly so that everything is well combined. Serve the fried rice immediately while hot! -This recipe is a great basic fried rice that you can add and change slightly to suit your taste. For example, frozen carrots or broccoli are two other types of vegetables that will taste great in this dish. You can also add some diced cooked chicken to the stir fry or top the dish with a cooked chicken breast. -White rice will work fine as a substitute to brown rice.